What if we could communicate with disaster affected communities in real-time just days after a major disaster like the quake in Haiti? That is exactly what happened thanks to a partnership between the Emergency Information Service (EIS), InSTEDD, Ushahidi, Haitian Telcos and the US State Department. Just 4 days after the earthquake, Haitians could text their location and urgent needs to “4636” for free. I will focus primarily on the way that Ushahidi used 4636. Since the majority of incoming text messages were in Creole, we needed a translation service. My colleague Brian Herbert from Ushahidi and Robert Munro of Energy for Opportunity thus built a dedicated interface for crowdsourcing this step and reached out to dozens of Haitian communities groups to aid in the translation, categorization and geo-location of every message, quickly mobilizing 100s of motivated and dedicated volunteers. So not only was Ushahidi crowdsourcing crisis information in near real-time but also crowdsourcing translation in near real-time. Text messages are translated into English just minutes after they leave a mobile phone in Haiti. 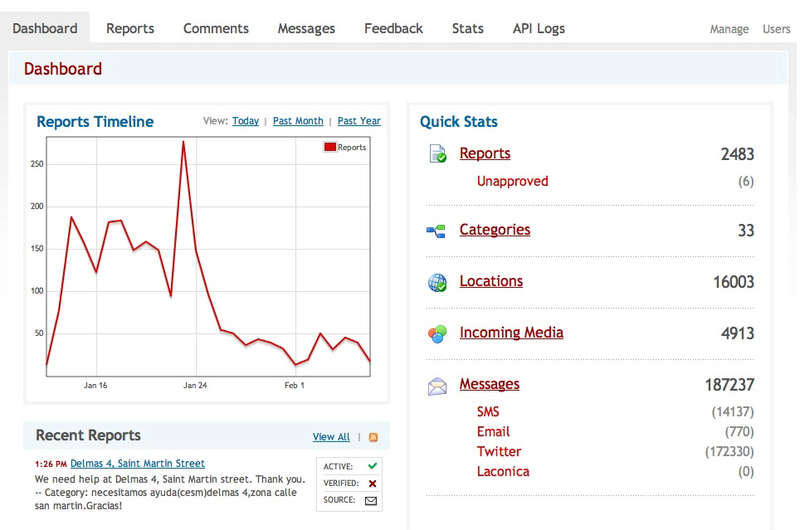 The translated messages then appear directly on the Ushahidi platform. The screenshots below (click on graphics to enlarge) illustrates how the process works. The original SMS in Creole (or French) is displayed in the header. In order to view the translation, one simply clicks on “Read More”. If further information is required, then one can reply to the sender of the text message directly from the Ushahidi platform. This is an important feature for several reasons. First, this allows for two-way communication with disaster affected communities. Second, an important number of messages we received were not actionable because of insufficient location information. The reply feature allowed us to get more precise information. The screenshots below show how the “Send Reply” feature works. We weren’t sure if Universite Wayal was the same as Royal University. So we replied and asked for more location information. Note the preset replies in both English and Creole. 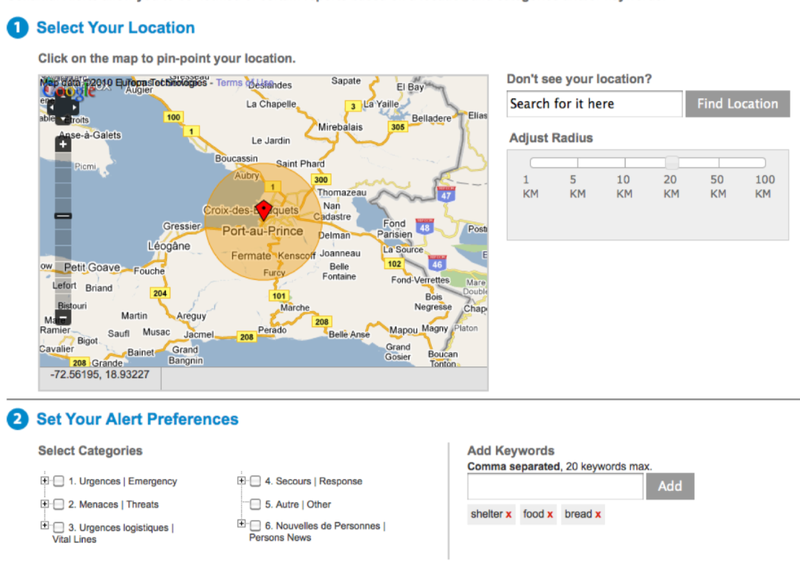 The presets include thanks & requests for more location information, for example. Of course, one is not limited to these presets. Any text can be typed in and sent back to the sender of the original SMS. This feature has been part of the Ushahidi for almost two years now. We send off the request for more information and receive the following reply within minutes. When we receive an urgent and actionable SMS like this one, we can immediately create a report. By actionable, we mean there is sufficient location information and the description of the need is specific enough to respond to, just like the example above. First, the GPS coordinates for the location is identified. This can be done directly from the Ushahidi platform by entering the street address or town name. Sometimes a bit of detective work is needed to pinpoint the exact coordinates. Next, a title and description for the report is included–the latter usually comprising the text of the SMS. This is what we mean by structured information. The report is then tagged based on the category framework. Pictures can be uploaded with the report, and links to videos can also be included. Finally the report is saved and then approved for publication. 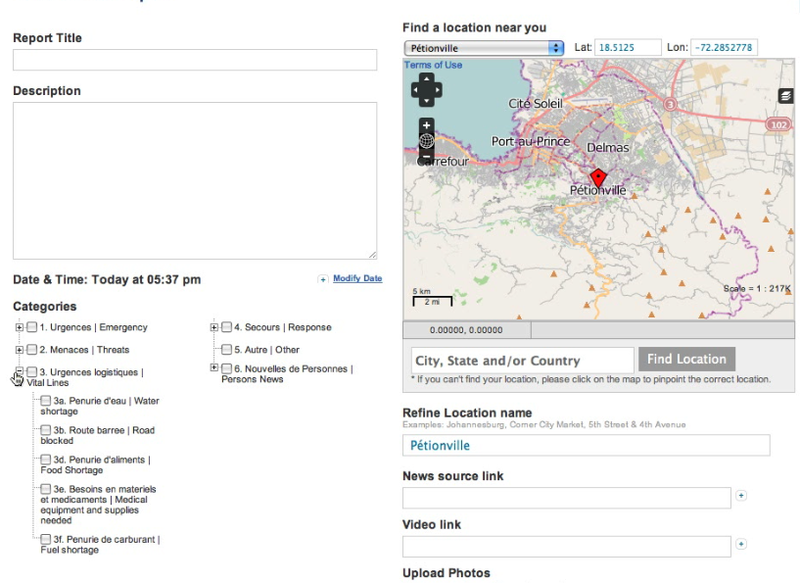 This is how the Ushahidi-Haiti @ Tufts team mapped 1,500+ text messages on the Ushahidi platform. We are now working with Samasource and Crowdflower to have the translation work serve as a source of income for Haitians inside Haiti. But how does all this connect to response? 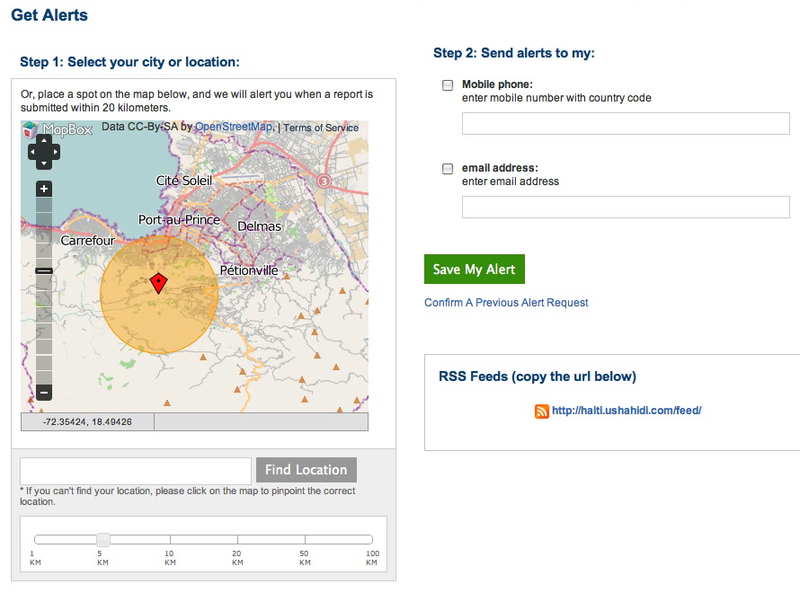 Ushahidi’s “Get Alerts” feature is one of my favorite because it allows responders themselves to customize the specific type of actionable information that is important to them; i.e., demand driven situational awareness in near real-time. Not only can responders elect to receive automated alerts via email, but they can also do so via SMS. Responders can also specify their geographic area of interest. 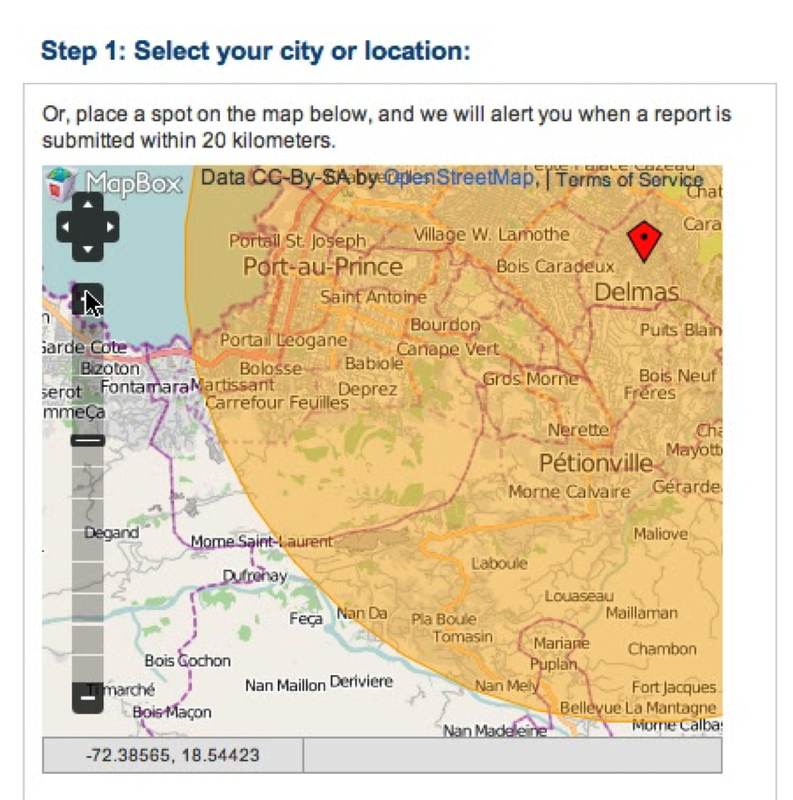 For example, if a relief worker from the Red Cross has a field office in neighborhood of Delmas, they can subscribe to Ushahidi to receive information on all reports originating from their immediate vicinity by specifying a radius, as shown below. The above Alerts feature is now being upgraded to the one depicted below, which was designed by my colleague Caleb Bell from Ushahidi. Not only are responders able to specify their geographic area of interest, but they can also select the type of alert (e.g., collapsed building, food shortage, looting, etc.) they want to receive. They can even add key words of interest to them, such as “water”, “violence” or “UN”. The goal is to provide responders with an unprecedented degree of customization to ensure they receive exactly the kind of alerts that they can respond to. On a more “macro” level, I recently reached out to colleagues at the EC’s Joint Research Center (JRC) to leverage their automated sentiment (“mood”) analysis platform. Sentiment Analysis is a branch of natural language processing (NLP) that seeks to quantify positive vs negative perceptions; akin to “tone” analysis. I suggested that we use their platform on the incoming text messages from Haiti to get a general sense of changing mood on an hourly basis. I’ll blog about the results shortly. In the meantime, here’s a previous blog post on the use of Sentiment Analysis for early warning. This entry was posted in Crisis Mapping, Crowdsourcing, Early Warning, Humanitarian Technologies and tagged Haiti, SMS, Ushahidi. Bookmark the permalink. Wonderful post on this truly revolutionary response to emergencies. For reference, please feel free to also check out this video interview featuring the story of how these admirable organizations came together to deploy 4636 in Haiti. FrontlineSMS, Ushahidi, Samasource, CrowdFlower: you are all awesome! This is beautiful use of technology! It gives a clear mapping of needs. 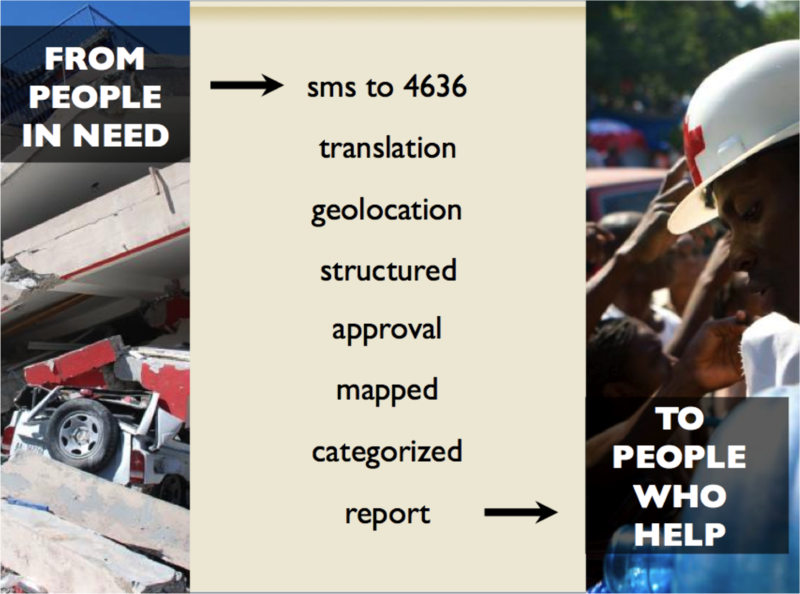 Ushahidi could also be used to coordinate numerous relief organizations to avoid duplication and gaps in delivery. I imagine it could include feature to allow relief organizations to report where and what type of aid has been delivered or they are intend to deliver.